In 1232 AD, the Anglo-Norman De Burgos came to Galway where they ruled for a period of time. They built a castle and defensive fortifications including the old city walls and a medieval hall, the Great Hall of the Red Earl, Richard De Burgo. The street we now know as Flood Street was originally named Earl Street or Sráid Tobar an Iarlaigh, and the lane beside it was known as Red Earl’s Lane or Boaher an Iarlaigh. A lease document dated 21 July 1820 shows that a ‘new’ Custom House existed at the time, so presumably the Custom House existed prior to 1820. Another lease dated November 12 1822 shows that Revenue (customs ) leased the old courthouse, which was then located on the site of the De Burgo Great Hall, for use as a Revenue warehouse for spirits and tobacco, so we can assume that the old county courthouse replaced the De Burgo Great Hall in the 1700s. Customs and Excise have been in possession of the site ever since. In 1824 there was a pub called Stauntons on the site of the Red Earl’s house next door to the old courthouse. Our photograph of the Custom House was taken in 1903. Though it is barely visible in our image, there was a small stone carving on the facade of a deer curled up. This signified a well (Tobar an Iarlaigh ), the theory being that the deer will not drink from a stream but go closer to the source. When this building was replaced by the current one in the 1940s, part of the specification given to the builders McNallys was that this carving be put back in precisely the same place as it had been. As it turned out, McNally had trouble with the foundation because they had a lot of pumping to do to dry out the well. Work on building a new extension to the Custom House started in 1997, but was deferred when important archeological finds were uncovered. The extension was completely redesigned to allow for the preservation of the archeological site and the new building opened in November 2001. It is a must-visit site in Galway providing us with a lot of clues as to how our ancestors lived and out city developed. 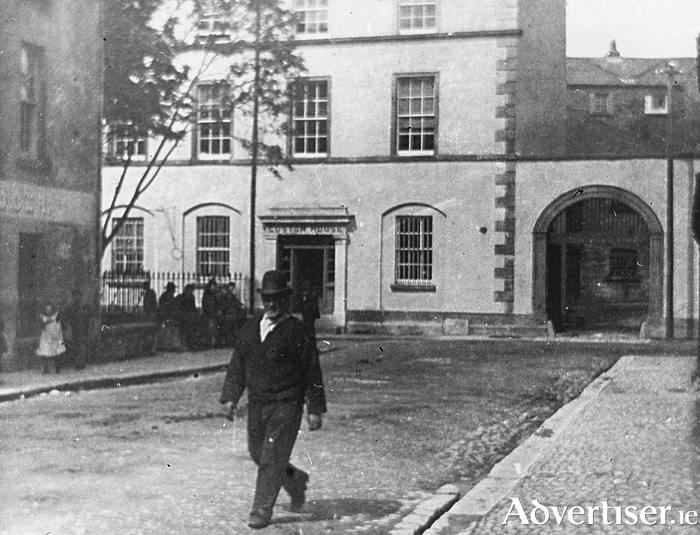 The railings on the left were known as Derrane’s, called after an Aran man who owned the corner building. There was often a crowd of fishermen or Aran men leaning against the railings waiting for Killilea’s pub to open. Derrane’s later became known as Connolly’s pub and was later turned into a sweet shop. In more recent years it was the area office of John Sisk, then became a hotel known as Brennan’s Yard. Today it operates as the House Hotel.